"Times change- This might not be right." So wrote the map's prior owner in the margins under item #23, an entry that purported the existence of a "Underground Sculpture." 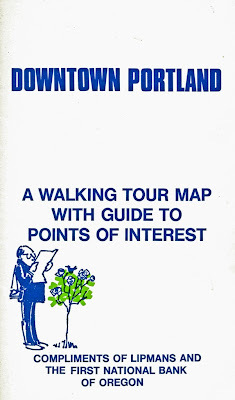 Downtown Portland A Walking Tour Map with Guide to Points of Interest was issued, complements of Lipman's department store and First National Bank of Oregon, some time between the dedication of O'Bryant Square in December 1973 (item #32 "One of the newest additions to downtown's collections of parks...") and the opening of the Galleria (absent on the map) in 1976. 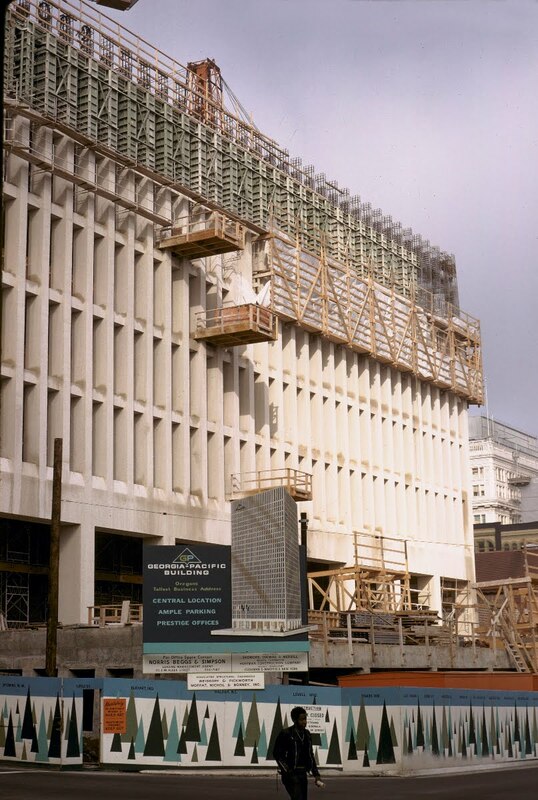 It provides of a glimpse of a watershed moment, when the Downtown Plan of 1972 began to produce tangible results, and of a Portland both familiar and alien. Benson Bubblers, the Dekum and Commonwealth buildings, Portland Art Museum, the Pioneer Courthouse and City Hall are highlighted, as well as landmarks of today with different names: Chown Electric (Kell's) the First National Bank Tower (Wells Fargo) and the Forecourt Fountain (Keller). Backwaters are brought to forefront: The Portland Center (item #1) and Lovejoy Fountain (item #2). 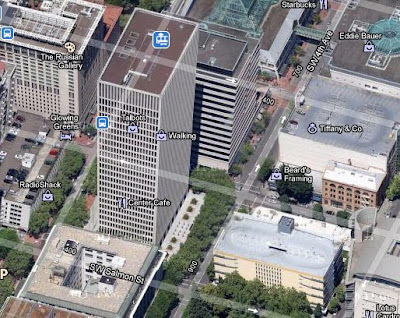 Some entrees, such as the Equitable Center (Unitus Plaza today) and Morgan's Alley remain, their prominence forgotten. 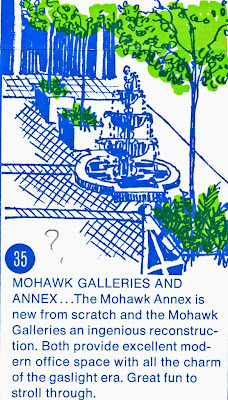 Others are gone (the Yamhill Market), some practically from memory (the Mowhawk Galleries and Annex on the block bounded by SW 2nd, 3rd, Yamhill and Morrison). Among the latter, I consigned the "Underground Sculpture." Surely it could not still be in place, unremarked, today. But what was its story? Where was it now? The Georgia Pacific building under construction, on the block bounded by SW Salmon, Taylor, 4th and 5th, in 1968. -Marion Dean Ross Photograph, University of Oregon Libraries, Building Oregon collection. 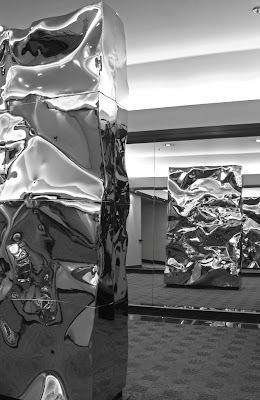 The eight foot tall sculpture of pressed formed and chrome-plated steel, by Oregon artist Bruce West, was installed in its subterranean home in August 1973, five years after the completion of the Georgia Pacific building. 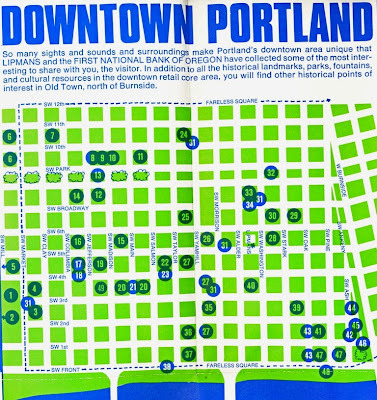 Its last mention in the Oregonian was on February 1st 1981, from a walking tour for for families titled Making the City Your Playground. A year later, Georgia Pacific moved its corporate headquarters to Atlanta Georgia. Beyond that time, I could not find reference of it anywhere. I checked a Google Maps satellite view. There was a parking garage across 4th from the Georgia Pacific building, today known as the Standard Insurance Center, but it looked of more recent vintage than its towering neighbor. Did it replace an older structure? If so, had the connecting tunnel been filled in? Alternate narratives formed in my mind. Did Georgia Pacific take the sculpture with them when they moved to Atlanta? Was it donated to the Portland Art Museum? Perhaps it sat in the lobby of the Standard Insurance Center, or in someones sculpture garden. There was a way to find out. I went to the parking garage at SW 4th and Salmon. I Followed the map's instructions and walked to the elevator. There was indeed a "C" level. I pressed the button and descended. The doors opened into a florescent lit corridor. I turned right and started walking. A short distance later the floor angled downward. It stood facing between mirrors that created an infinity of gleaming silver sculptures. I was the only person there. The silence fostered an illusion of stopped time. Unlike an outdoor sculpture it had acquired no patina with age, it was pristine. It was still August 1973, art for automobile commuters, two months before the Oil Embargo. I noticed how the mirrors opened up a space which otherwise would be too small for the piece's scale. I thought about the traffic on 4th Avenue passing unheard above my head, and of Richard Nixon. It had been there all along. It seemed so unlikely. Times change. The sculpture had not. Downtown Portland without Max, the Bus Mall or Pioneer Courthouse Square but with Front Avenue and Fareless Square. Dan, your discovery of the underground sculpture is intriguing as usual. I've never heard a word about its existence. 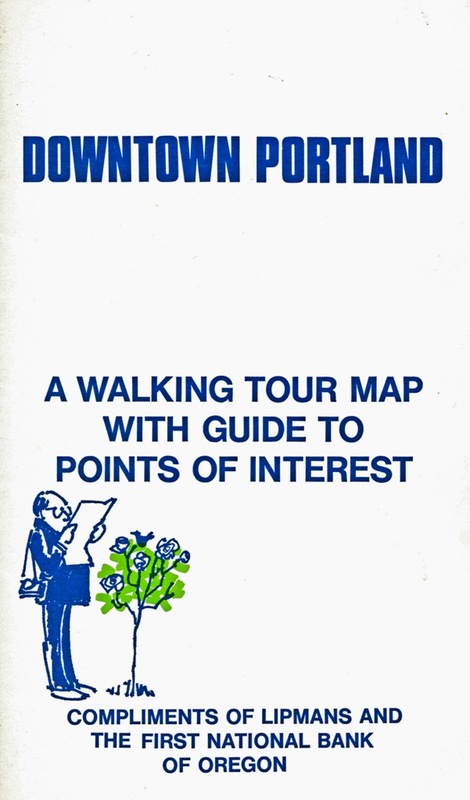 I like the colors and layout of the old guide to Portland as well. Absolutely incredible! Thanks for bringing this to the surface! So to speak. I used to walk through that tunnel often during my rambles downtown during the early-to-mid-'80s,when I was a teenager. There was a clean restroom down there, and, yes, a small museum dedicated to the glories of Georgia-Pacific and their long war on trees. I walked through a few years ago just to check on whether the sculpture and mirrors were still there; I'm glad G-P didn't take those away when they left. Dan, Can you post the other half of the brochure with the corresponding key for the numbers? If you're really a Portlander, you should know about urgent care portland clinics too. I heard that they're one of the best urgent online help care present there. We should probably see and witness how they roll. This is a beautifully done story, Dan. Such a great post. thanks for sharing this. It’s an awesome post to learn. You have nicely presented the concept on this post. Bravo! Carry on …I’m waiting for more...Can you please make some post onphotograph retouching? Thanks for the post and sharing the blog. Valuable and excellent post, as share good stuff with good ideas and concepts. lots of great information and inspiration. I just would like to say thanks for your great efforts.I appreciate your excellent post. The sculpture are you share that is excellent and very easy.the subject is not easy but the capability of your presentation is really good. Because Playa del Carmen has kept up its status as a little angling town every one of the exercises are found along the couple of miles long strip that keeps running along the city known as Quinta Avenida, or 4th Avenue. I find a very good website for the Towing Company Topeka KS, If you want you can visit this site.